Pondicherry-based Henk Van Putten creates an interesting liaison between art and mathematics with his recent stainless steel installation, Hardly Touching, at the Promenade hotel. Commenting on the two-and-a-half-metre tall work of art, Putten says, a�?It is abstract, as is all my work. The work consists of five circular segments. The composition is like a movement where the elements meet each other but do not touch. This type of mathematical play is part of all my work.a�? 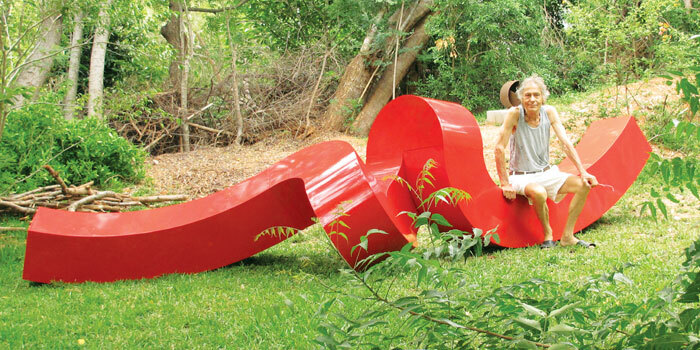 The artist uses different kinds of material like steel, wood, copper, brass, bronze, concrete, aluminum and granite. The 78-year-old is passionate about geometry and shares, a�?It is my belief that I am an instrument in higher hands. Geometrya��circles, squares, triangles and so ona��are divine phenomena. I just use them and try to make something which is interesting in my opinion.a�? Puttena��s tryst with art began in the 50s, when he was attending technical school in Amsterdam, while also working in an atelier for window dressing and decoration. By 1965 he had set up his own consultancy in Amsterdam, though by the 70s he wanted to explore more options and moved to Ibiza as a freelance artiste. An Aurovillian since 2000, he has done commissions for big firms like SAP, Herman Miller and Wolters Samson. Hailing from the Netherlands, Putten is also known for his wall art and paintings. a�?There are periods when I paint or make reliefs and drawings. The wall works are always related to my sculptures. I make these two-dimensional works as a kind of study for the three dimensional. The paintings are mostly made on plywood cut-outs,a�? adds the artist whose first solo exhibition was at the Museum Fodor Amsterdam. Since then he has displayed his work at several exhibitions across Europe, from Basel, Cologne and Frankfurt art fairs, to the Indian Harmony Art Show organised by Tina Ambani in 2007. Up next, Putten will be busy in Peking, China, as he will be installing a five metre tall work of art titled, Stretching. It has won him the Liu Kaiqu Excellent Award 2014, which is considered to be the most prestigious award for sculpture in China.